The Museum of Science Fiction proposes a 2-year, $399,750 program to inspire students from underserved communities to become future STEM professionals and innovators. Science fiction has long inspired young people to become STEM professionals who then go on to create the very technology they first imagined in art. We are inspired by the cell phone (first seen on Star Trek as the communicator), by the world of undersea exploration here on Earth and the prospect of the same on other planets in our solar system (first seen in the works of Jules Verne). We are motivated by the ways in which technology of science fiction has inspired scientists and engineers to create lifelike prosthetic limbs for humans, and robots for safer space exploration, marine research, and rescue operations. We are inspired by the societies science fiction describes, in which equality is universal, poverty is eliminated, and education is freely available to all. We aim to use science fiction – and science fiction’s vision of a better future – to motivate students, especially those from underserved communities. Through formal and informal learning, we want to boost enrollment in formal STEM academic program areas, and raise interest in informal STEM-related activities across society. This is particularly critical because of the existing systemic challenge of re-supplying the STEM pipeline with renewed student interest and participation in science, technology, engineering, and math. Left unresolved on a domestic level, over-reliance on an external / transient workforce to fill STEM jobs creates an unsustainable socio-economic infrastructure and ultimately threatens future domestic stability. Left unresolved on a global scale, our planet will be unable to cope with world issues, and will become more susceptible to chronic transborder problems such as hunger, overpopulation, drug trafficking, human trafficking, pollution, climate change, war, terrorism, disease, poverty, and racism. To increase the number of young people, especially from underserved communities and marginalized groups, to become future STEM professionals, our program will use the Outdoor Learning Lab, a travelling classroom that uses a full-size replica of a 28-foot Starfleet shuttlecraft as a STEM teaching platform for inspirational learning. This program is modeled in part after our 2016 CubeSat competition, in which we partnered with Cornell University to select the three most innovative high school team proposals for development and assembly by NASA Space Grant universities and launch by NASA. Winners included students from underserved community schools such as El Paso’s Bowie High School, which has 98% Latino enrollment and a 22% dropout rate. The award transformed student outlooks and set new life trajectories with intentions to pursue college engineering programs. See the award acceptance here. This program is also partially funded by NASA’s Heliophysics Education Consortium, which awarded the Museum of Science Fiction a five-year grant of $222,708, in part to develop the educational design of this program. In space, engineering matters. It is the man-made balance scale on which human lives teeter. On Earth, if a car breaks down, a person can get a ride home with friends or a taxi. If a shuttlecraft breaks down on an alien planet, oxygen runs out, food stores run out, and no one goes home alive. For space-based scenarios, outcomes can change drastically if engineers and science officers can fix what is broken or come up with an ingenious solution. But that is a big if. Precisely because there are no other options in space, spaced-based engineering narratives are stronger and far more compelling than comparable engineering narratives on Earth. Indeed, science and engineering space-based narratives have proven sufficiently compelling over time, spawning their own literary genre – science fiction. This program uses compelling narratives provided by an engineering-in-space context, combined with hands-on activities using a full-size shuttlecraft (e.g., Type-9 class) as an outdoor classroom, to underscore the importance of engineering decisions. The basis of the lessons is taken from the California State Science Standards, but their excitement comes from the narrative. Hands-on, real-time participation in an emotionally gripping narrative not only drives initial engagement, but also long-term memory retention. In these scenarios, students and visitors will pilot the shuttlecraft, take scientific readings, deploy the shuttlecraft’s technical equipment, and make impromptu jury-rigged devices -- all the while watching each decision play out its real-time consequences in front of them. 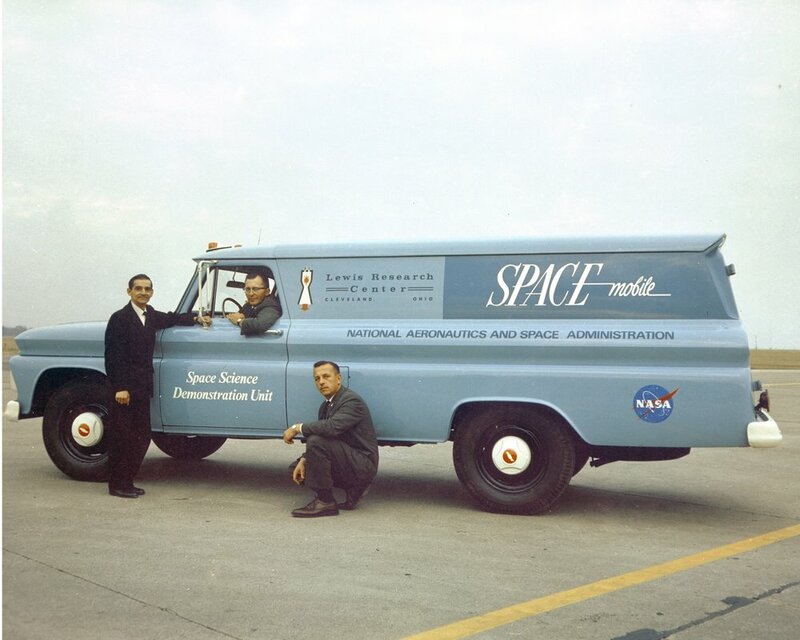 Similar to NASA's Spacemobile program in 1962 (discontinued in 2007), the Museum’s Outdoor Learning Lab will bring educators equipped with models, dynamic exhibits, films, handouts, virtual reality, mobile applications, and other visual aids to the students. The Museum’s education staff will coordinate with teachers and school district science departments to bring STEM-related technology directly to the students. The shuttlecraft experiences will all have a similar format. Each lesson begins with cut scenes played out on monitors to establish a scenario. A docent (the chief engineer) then guides students with questions and hints so they can begin designing an appropriate engineering solution. Once a solution is chosen, the individual students can each try to deliver their proposed solution by manipulating the onboard shuttlecraft control systems or shuttlecraft equipment. Students will be able to see how the shuttlecraft and its equipment responds to their intervention through interactive computer readouts, tactile/physical feedback, screen visualizations, and cut scenes showing the responses of (fictitious) remote personnel. The consequences of the engineering solution they have attempted will become obvious as it is played out in real time. Students will see whether their solution led to mission success or failure. At the end of the scenario, students are given small mementos, such as communicator pins, or officer’s bars, or science-themed bumper stickers. Because all shuttlecraft scenarios will be based on state science standards, they should also integrate seamlessly with classroom instruction. Schools that receive a shuttlecraft experience will have a suite of 8-10 relevant scenarios to choose from. Each scenario will be targeted towards multiple science concepts already mandated by state standards to be covered in grades 9-12. Teachers can download instructional materials from the Museum’s website to use in conjunction with their normal lessons on these topics. If deployed in-class the day before (or week before) the shuttlecraft arrives, the shuttlecraft experience will serve as a capstone to prior classroom instruction. In addition to instructional material, a list of the standards each scenario addresses will also be available, so instructors can compare them against similar standards checklists for their existing lesson plans. In order to establish the intrinsic merit of the shuttlecraft scenarios among accomplished educators and educational researchers, we will begin gathering concrete proof of their educational impact as we conduct the experience. Specifically, we will offer teachers a set of optional short pre- and post- shuttlecraft experience quizzes, encourage teachers to use these assessments with their students, and use a web-based system to report anonymized results back to program administrators. The five to ten question quizzes will be designed from well-vetted concept inventories available in the educational research literature. Concept inventories focus on whether students understand a concept deeply enough to avoid common misconceptions. These kinds of assessments contain no statistical analysis. Due to both the nature of these assessments and the way their scores are normalized, concept inventories have been singularly successful in identifying whether a given method of teaching is more effective than another method, while accounting for data variations due to the quality of teachers and students involved. For example, despite enormous variations in the quality of different lecturers and students, and across a wide slew of both high schools and colleges, the Physics Force Concept inventory was able to produce a narrowly (to +/- 17%) defined measure of the effectiveness of lecture as an instructional mode. The same tool showed a different, more interactive instruction mode could increase students’ effective learning by about 100%, even with the same instructors. Large-scale funding agencies, such as the National Science Foundation, would require concrete proof of educational effectiveness before committing large amounts of support for expanding the shuttlecraft experience, something we hope to accomplish in the future. Most of the drop-off in science, technology, engineering, and math pathways begins to occur around grade 9, when science (and some math) courses become optional, and students have the chance to avoid classes they deem uninteresting, too difficult, or irrelevant. The stakes for providing interesting and contextually relevant STEM instruction thus rise considerably around grade 9. The shuttlecraft experience lesson plans are all crafted around the four-year window of high school. A few prototype lesson concepts are available upon request. Lesson concepts would be teacher-tested, student-tested, and revised as needed before implementation. Because students can’t always tell science fact from science fiction, one necessary addition to these lessons will be an introductory discussion on which aspects of the experience are purely fictional and have no basis in current science fact (for example, transporter technology and the ability to beam down to a planet surface). The Museum of Science Fiction will sustain the Outdoor Learning Lab program through the dissemination of the research findings to educators across the country and abroad. The Museum’s web portal will allow teachers to download and tailor resource materials to meet the specific needs of their classrooms and curricula. Once teachers present the resource materials to their students, they will have the opportunity to upload their comments and suggestions to the Museum’s website. The primary goal is to give teachers the tools they need to successfully introduce or enhance STEM-related content in their classrooms. With this program, the Museum of Science Fiction will draw on iconic fictional societies, technology, and adventures to inspire young people from underserved communities to become future STEM professionals and innovators. Our methods have begun to successfully transform the outlooks of young people from settling for the status quo, to reaching for the stars. Please contact info@museumofsciencefiction.org with any additional questions.